Community members ended up planting 120 trees in SeaTac to a site that was previously taken over by invasive blackberry and ivy plants. Read the full Tukwila Reporter article below. I had the honor of giving the welcoming remarks at the kickoff of Governor Inslee's Maritime Blue Strategy. The Strategy aims to advance the region’s maritime-based, “blue economy” through increased collaboration between its diverse sectors to promote innovation and sustainable practices that support a competitive gateway with a 21st Century workforce. Read the full article below. 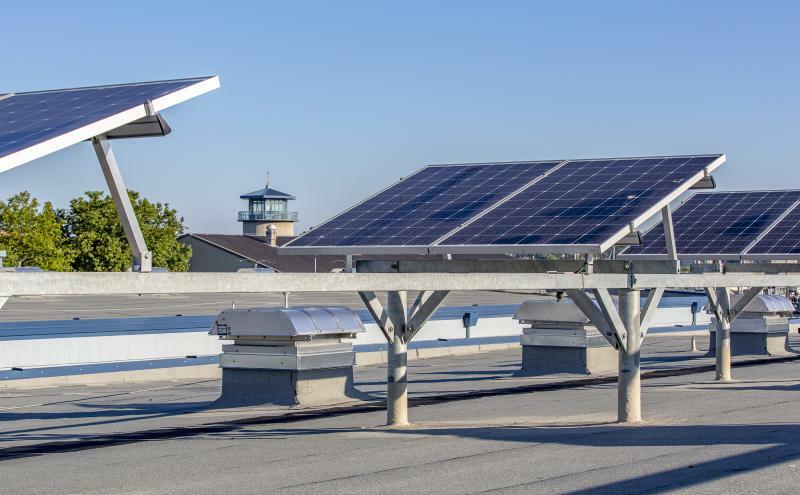 Thanks to plenty of sunny days, the solar array installation at Fishermen’s Terminal has been a bright spot in the Port's environmental plan. I am honored to work with Governor Inslee on the new Maritime Blue Strategy. Read more on the project below. Among the other speakers at the report’s unveiling was Seattle Port Commissioner Fred Felleman, who declared the report to be evidence of a “renaissance” in the maritime business. Read the full West Seattle Blog article below. In what will be a major upgrade for international passengers, the final structural roof beam was raised by a crane and safely put in place today marking the latest construction milestone of the new International Arrivals Facility at Seattle-Tacoma International Airport. The ‘topping off’ of the main IAF structure highlights the project is rapidly progressing towards its scheduled opening in the fall of 2020 when the new 450,000 square-foot grand hall will be five times larger than the current 1970’s-era facility. Read the full article below. While the Governor’s Maritime Blue kickoff did not make news, the Seattle Times picked up the Bloomberg story about efforts being made to decarbonize the shipping industry. The Port is making major investments to electrify the waterfront to help to that goal. Read the full article below. Learn more about important Port industries. Checking in with Port of Seattle Commissioner Fred Felleman about the Port's restoration pilot project at Smith Cove in Seattle, Washington. We seeded 6,100 pounds of native Olympia Oysters to enhance water quality. Teens Learn of Maritime Careers on the Adventuress, which docked recently at Shilshole Bay Marina in Seattle, WA.